Disclaimer: This product was sent to me for review purposes. I am not being paid to post this review. All of my opinions are honest and to the point. I am not affiliated with this company. 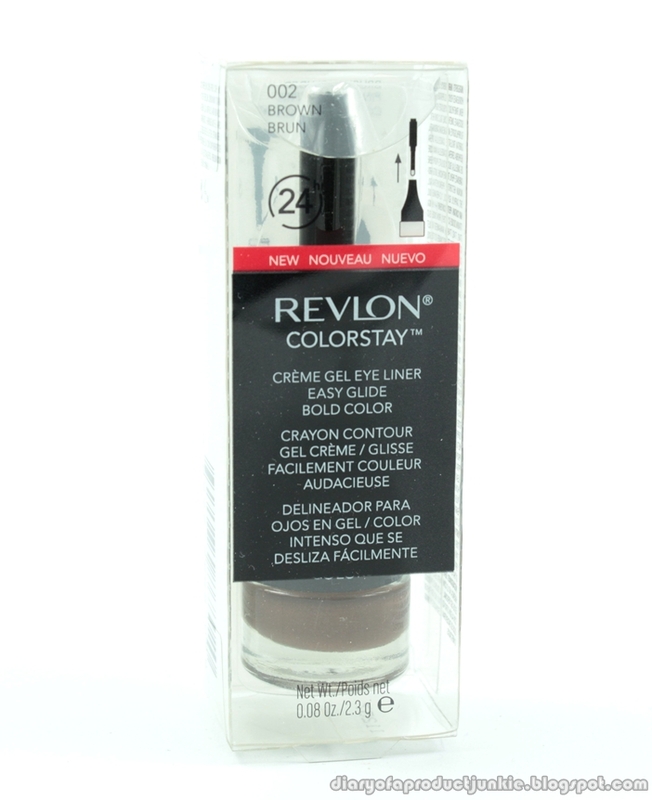 Hello, lovelies~ Along with the packet that Revlon sent last week, I got to try the eyeliner gel from the Revlon Colorstay collection. 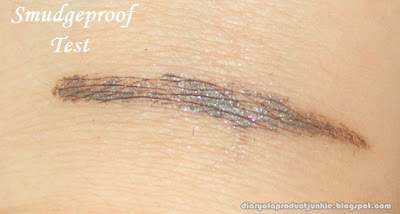 I've tried other gel eyeliners from Maybelline, L'oreal and Silkygirl. I'll probably do a comparison post later this month. 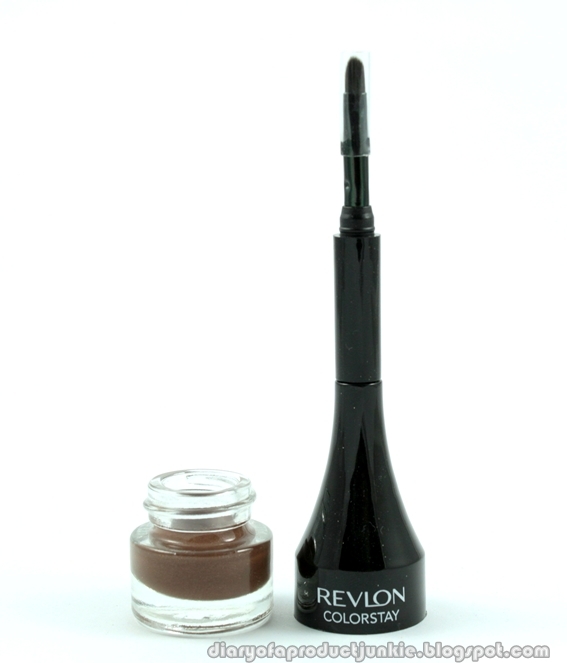 The gel eyeliner comes in a round pot with a black cap that has a pointy tip. The packaging of the gel eyeliner is efficient as the brush is hidden on the top.The cap is firm enough to take travelling inside a travel makeup bag. 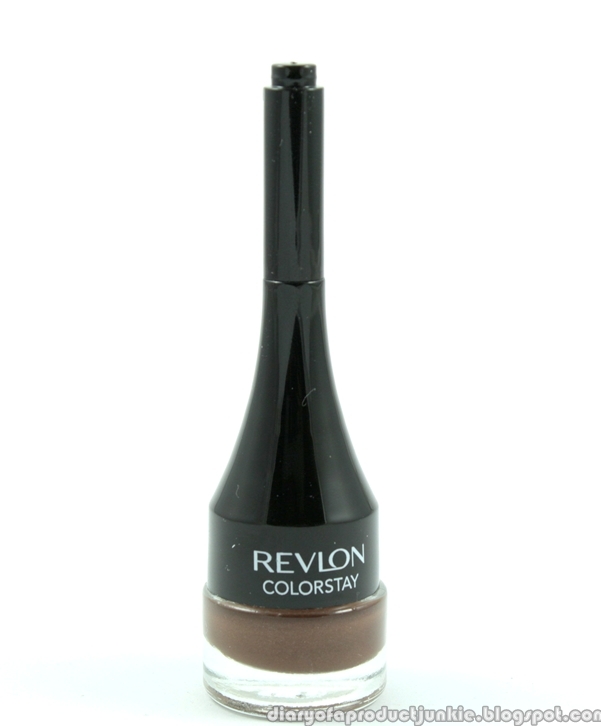 The brush that came with the eyeliner is of good quality, unlike most brushes that came with a certain product. It has a slightly wide size, but I can flip it to the side to make a fine line. 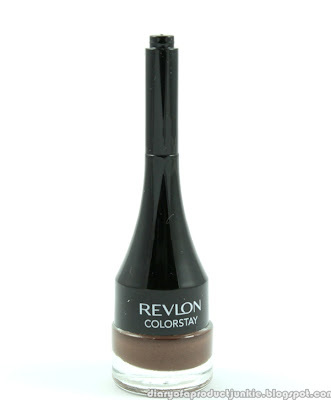 The bristles are quite stiff, but they are soft and doesn't irritate my eyelids at all. I got the eyeliner in the shade brown. 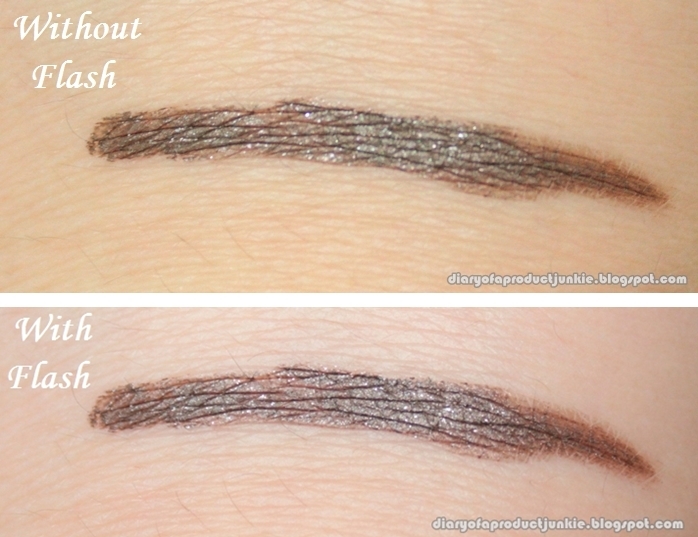 I noticed shimmers immediately in the eyeliner, not a matte brown. One swipe on the back of my hand and my eyelid, the color is not too pigmented. It's quite sheer, to be honest. I need at least two swipes to get good color pay off on my eyelids. The eyeliner is definitely waterproof. After I swiped it on the back of my hand, I left it untouched for five minutes. To test for its waterproof property, I ran my hand under running water from the tap. 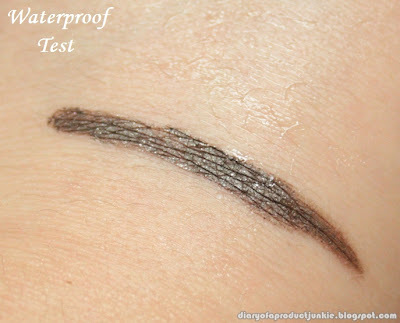 I then pat it dry with a tissue and the liner was still there. Next up is the smudge test. After I pat my hand dry with a tissue, I tried rubbing the eyeliner on the back of my hand really hard. The liner smudge slightly, but after a hard rub on the back of my hand. That is a good sign, people. It doesn't smudge easily. Even if it does, you would have to rub it with all your might to get it to move. 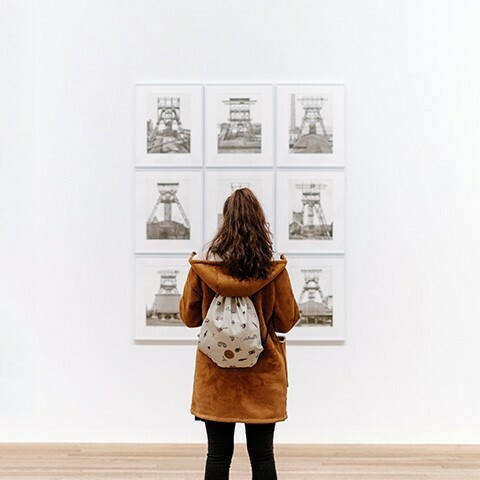 As for the staying power, it is unexpectedly long lasting. 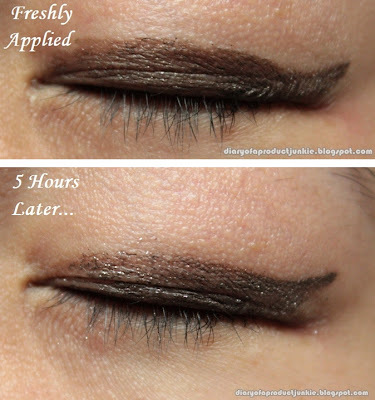 Without an eyelid primer, it lasted 5 hours. Even beore I remove it, it's still in a pretty good shape. All throughout the 5 hours, I sweat, watched TV, and cried. After all these activities, the cat eye point was still visible, which is rare for a gel eyeliner on my eyelids. 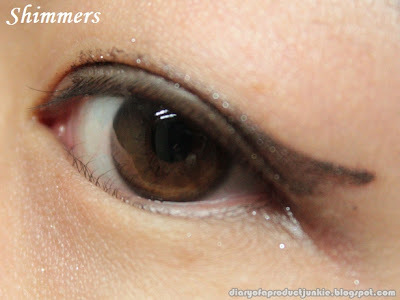 However, the middle part of the liner has faded, a common problem with all gel eyeliners on my eyelids. hmmm, I might have to try this. I have maybelline's gel liner and I love it, but I'm always willing to try new things. prefer yg mana sama silky girl sis phanie? Sha, aku juga ga nyangka dia tahan segitu lama..
Yohana, lebih ke ini sih, Silky gaampang hilangnya di kelopak mataku.